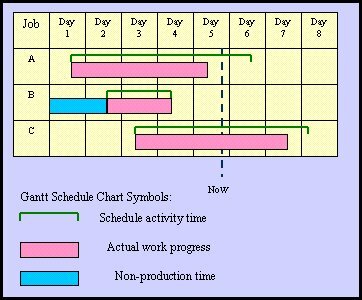 Gantt Schedule Chart focuses on the activity sequence and timing for various components of a job. It can also be used to monitor the actual progress of a job in relation to the plan. Each of the green brackets on the time axis denotes the estimated starting and finishing of a job enclosed within it. The red solid bars reflect the actual progress of the job. The blue solid bar indicates the non-production time or maintenance time. The blue dotted line indicates that the current date. Therefore, the progress of the schedule can be checked out whether it is ahead of schedule, on schedule or behind schedule. 1. Job A is about one-half day behind the schedule. 2. Job B was completed after equipment maintenance, it is on schedule. 3. Job C is ahead of schedule.